This burger is a meal. Don't even think about a bun. You might even want to skip the ketchup too. 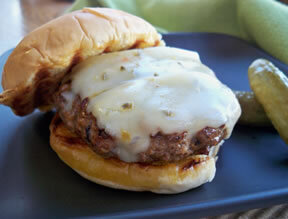 These burgers are close to 1/2 pound of ground beef with a healthy dollop of blue cheese in the center. Two patties are formed around a nice slab (flattened) of blue cheese. Make sure to connect and knead the two patties together well at the edges. Take time to hand-patty all the way around to ensure no holes or halves not blended into one hamburger. Total grill time 10-15 minutes on hot grill. DO NOT press down on the stuffed blue cheese burger! If you don't have a leaking burger at the end of the grilling you pattied well! 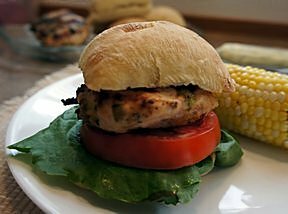 Stuffed Hamburger with Herb Cheese-Be Done With the Bun!